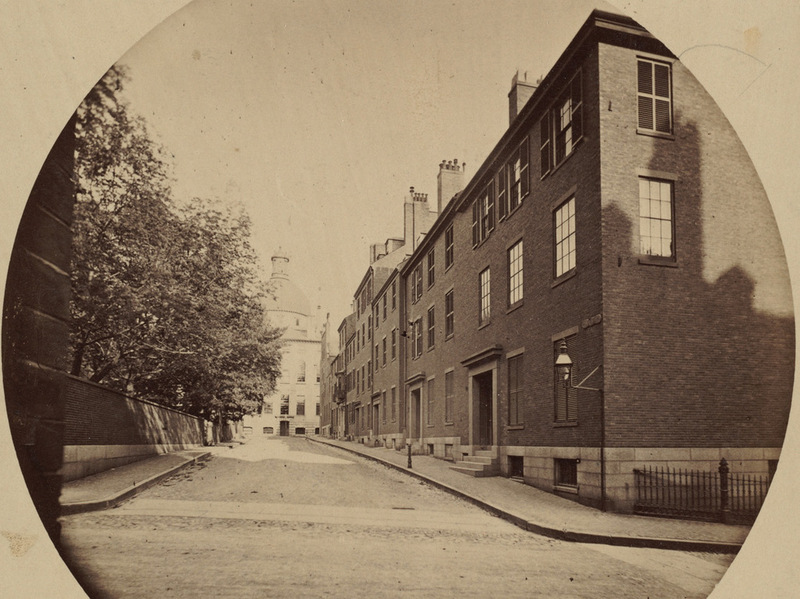 Mount Vernon Place, seen from Joy Street in Boston around 1860. Image taken by Josiah Johnson Hawes, courtesy of the Boston Public Library. Mount Vernon Place is a short street in Boston’s Beacon Hill neighborhood, located just west of the Massachusetts State House. It was once a full block long, and was developed in the 1830s on land that had once been owned by John Hancock and his family. 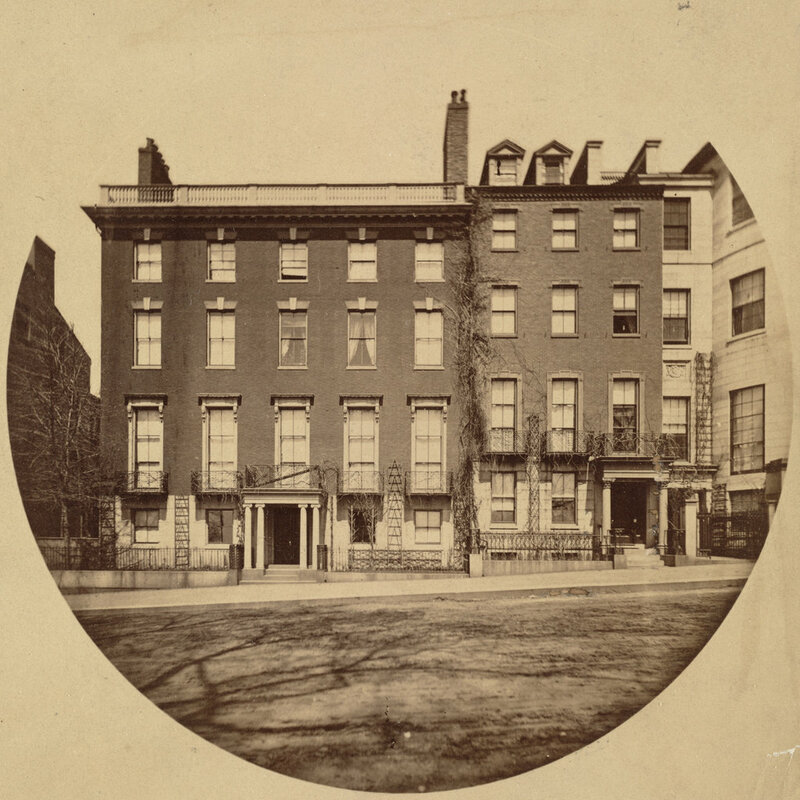 As the 1860 photo shows, the street had a small park on the left side and eight townhouses on the right, and at the end of the street was the State House. 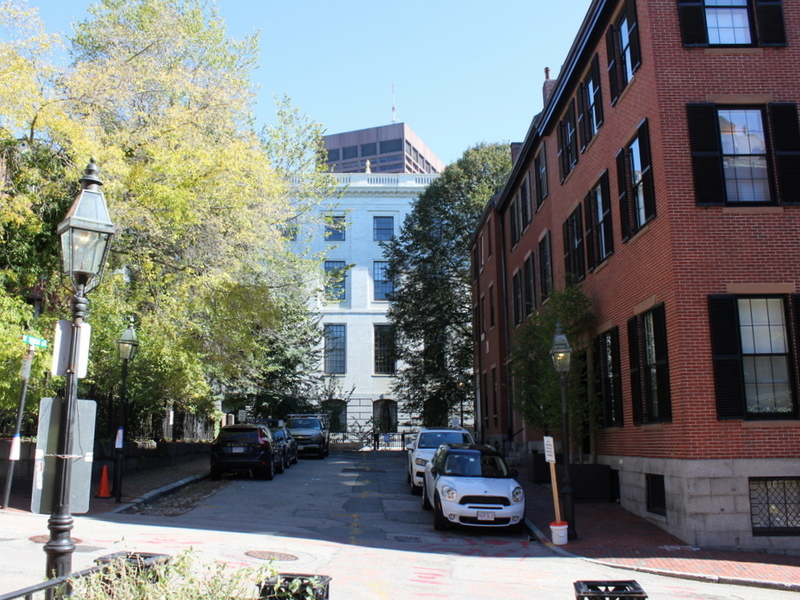 The five houses closest to the State House were demolished in the 1910s when the building was expanded, and today only the three in the foreground survive. These three were built around 1833-1834, and have been largely unaltered on the exterior since then. 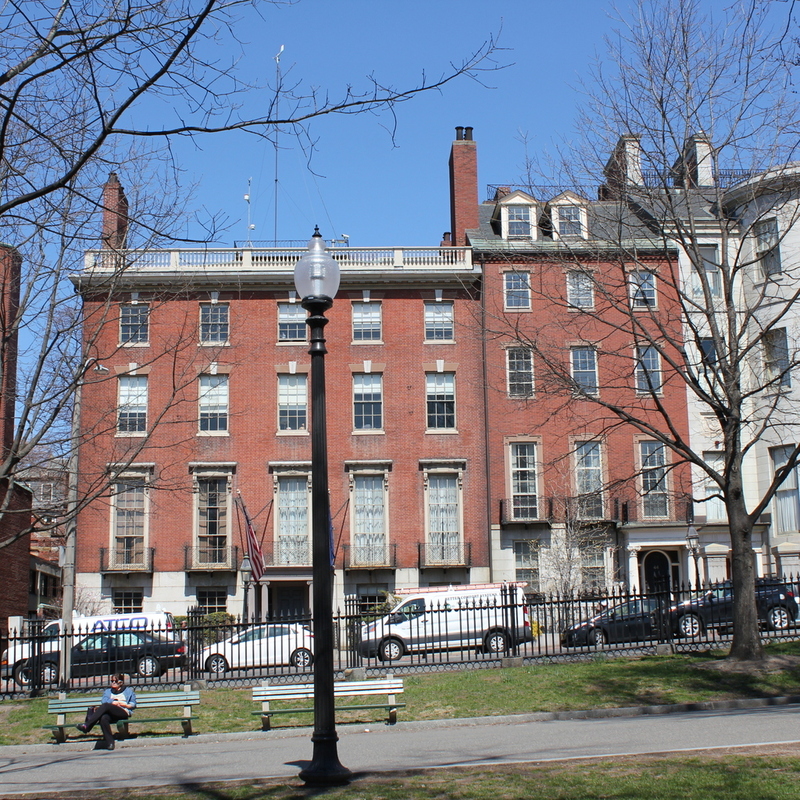 They are among the many historic early 19th century townhouses that have become a defining feature of Beacon Hill, and they form a part of the Beacon Hill Historic District on the National Register of Historic Places. 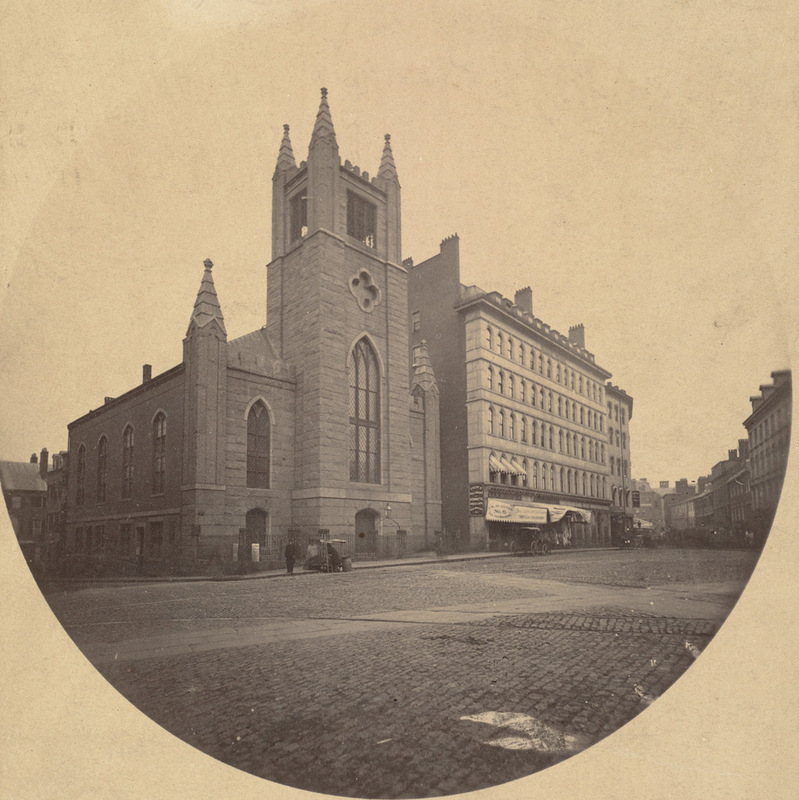 The Bowdoin Square Baptist Church in Boston, around 1860. Image taken by Josiah Johnson Hawes, courtesy of the Boston Public Library. 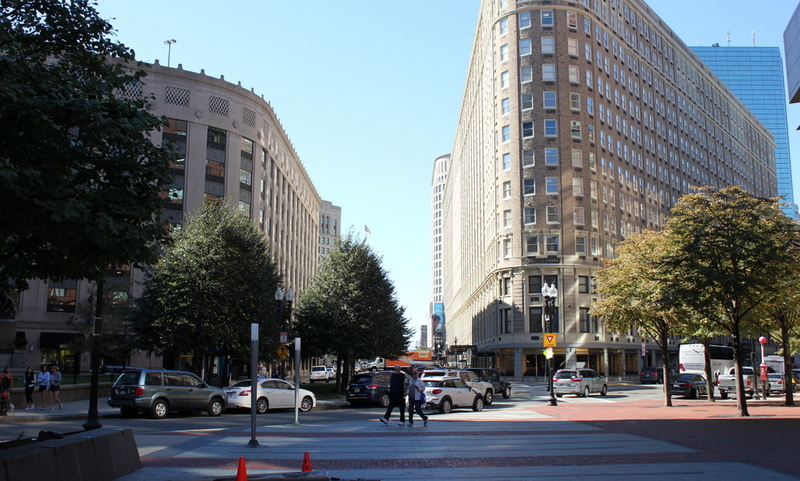 This scene shows Bowdoin Square facing the opposite direction from the one in the previous post, facing east on Cambridge Street toward Government Center. The most prominent building in the first photo is the Bowdoin Square Baptist Church, a Gothic Revival style church that was built in 1840. Its design is very similar to several other churches that were built in Boston around the same time, including the old Trinity Church on Summer Street and the nearby Bowdoin Street Congregational Church, which is still standing today as the Saint John the Evangelist Mission Church. The church here at Bowdoin Square gained some notoriety in 1885, when the congregation split after the pastor, William W. Downs, was found in what was alleged to be a “compromising position” with a woman from his church. The scandal was well-publicized in newspapers across the country, and the church split into two factions, with one supporting his removal and the other believing his claims that he was the victim of a conspiracy. He was eventually dismissed from his position, and the church closed, but he maintained his innocence and several years later won a lawsuit against his accusers, with the jury awarding him $10,000 in damages. Following the Downs scandal, the church became the Bowdoin Square Baptist Tabernacle, and it was extensively remodeled on the exterior and interior in 1898. However, the church sold the building in 1916 to the New England Telephone and Telegraph Company. 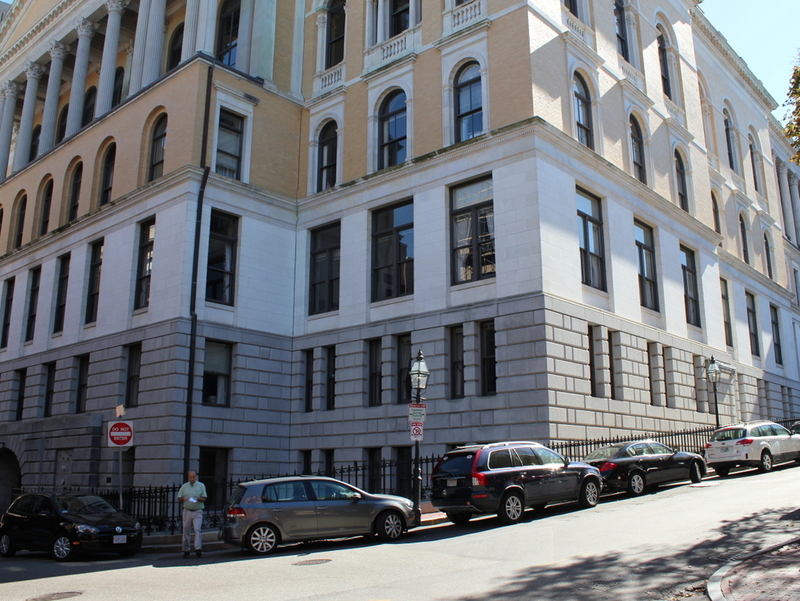 Around 1930, they demolished the church and the neighboring Coolidge Building to the right, in order to build their new Boston headquarters, which is still standing in the 2015 photo. 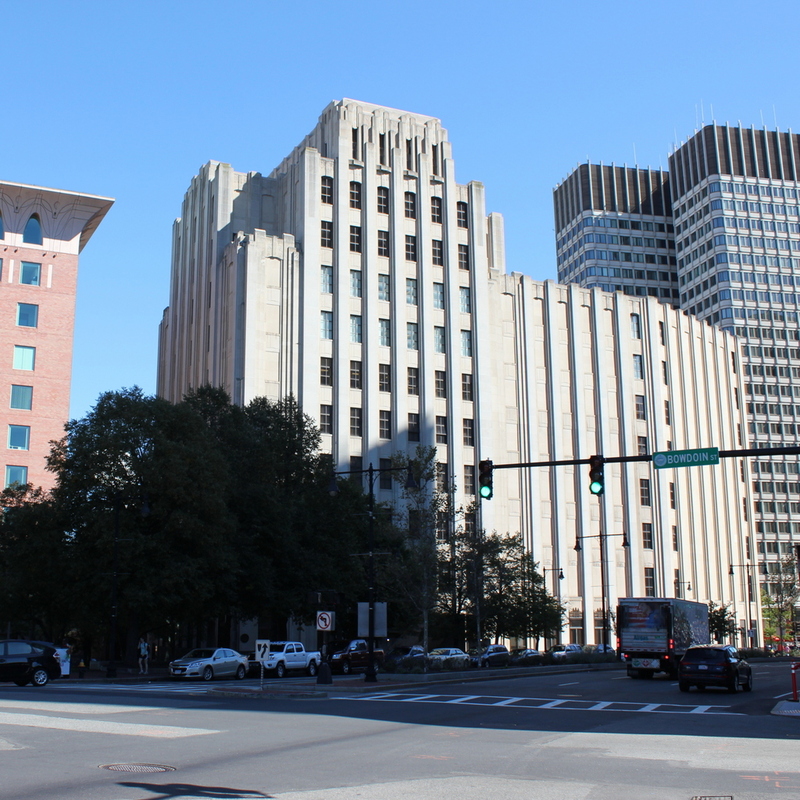 None of the other buildings remain from the 1860 photo, either; most of this section of Boston was demolished in the 1950s and 1960s as part of the West End and Government Center urban renewal projects. 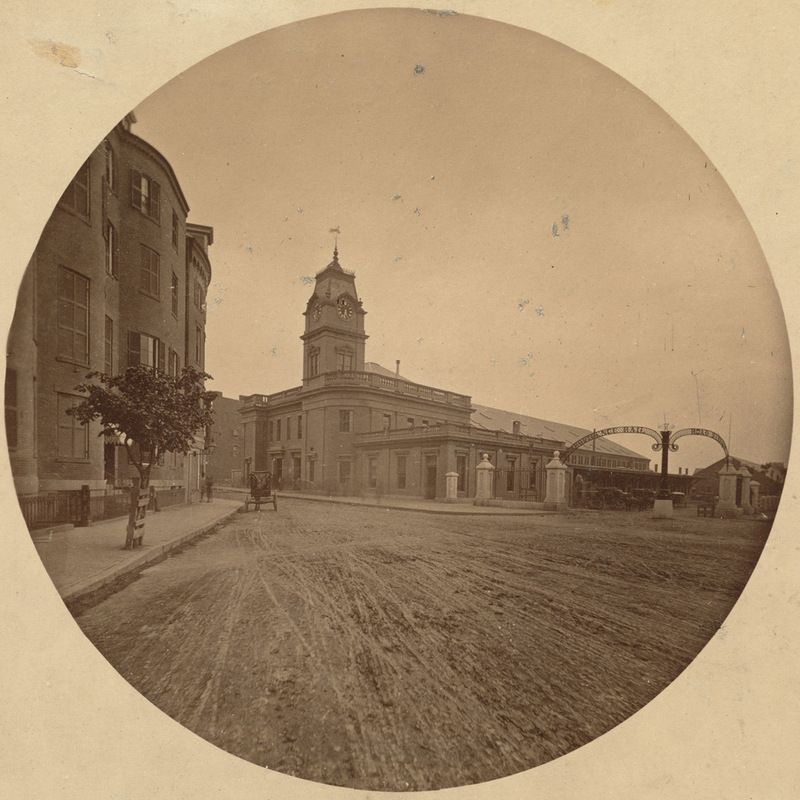 The Boston and Providence Depot at Park Square in Boston, around 1860. Image courtesy of the Boston Public Library. The station around 1885. Image courtesy of the Boston Public Library. The Boston and Providence Railroad opened in 1835, at a time when Boston was still a peninsula connected to the mainland by a narrow isthmus. To avoid taking up scarce land, the railroad built a long trestle across the Back Bay, which at the time was a tidal marsh between Boston and Roxbury. The railroad terminal was built here at the edge of the water, at what eventually became Park Square. 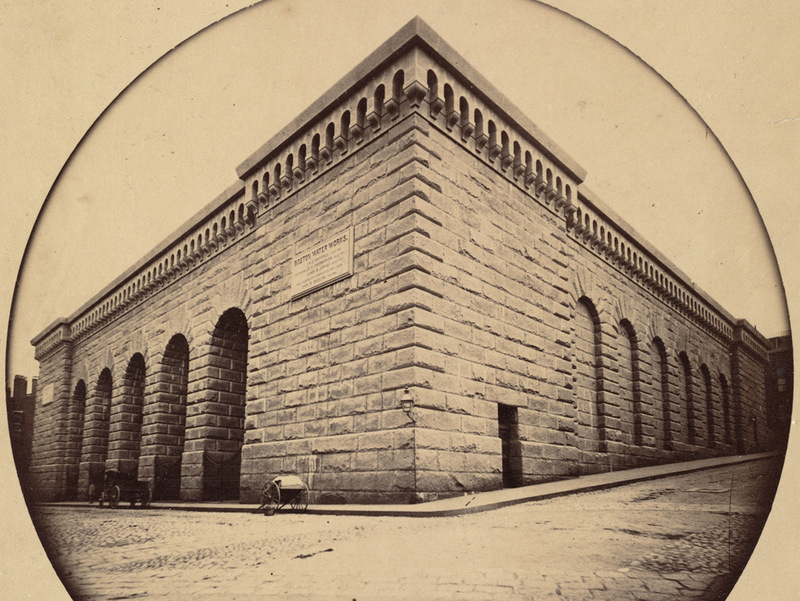 The original station from the first photograph was demolished in the early 1870s so that the city could build Columbus Avenue, and it was replaced with the much larger station in the second photograph. In advertisements, it was hailed as “The Palace Depot of the World,” and from here passengers could board a train for Providence, New York, and other points south. However, by the late 19th century there were eight different railroads serving Boston, each of which operated its own separate station. The four railroads on the north side all had terminals near where North Station would be be built in 1893, and three of the south side terminals were located in the immediate vicinity of today’s South Station. The Providence and Worcester depot was the one outlier; it was on the south side, but it was a half mile away from the next closest station. 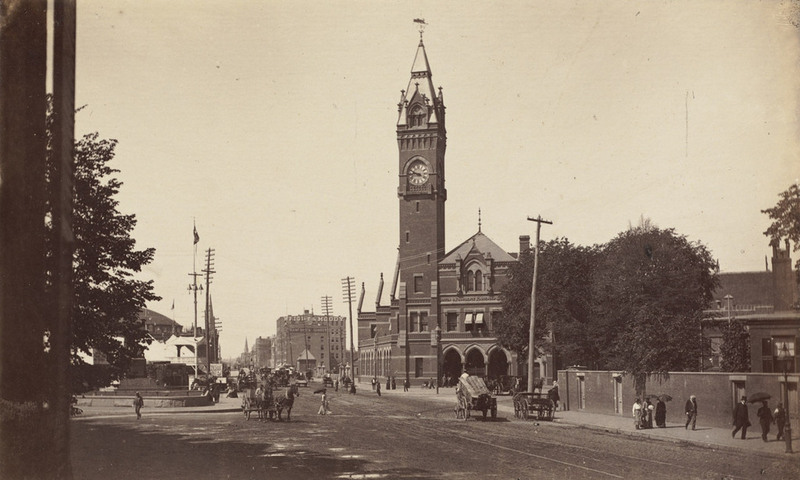 Because the multiple stations were both inconvenient for passengers and a waste of valuable property, the four south side railroads finally consolidated into South Station in 1899. This station and the tracks leading to it were closed, and the railroad, which by then had been leased to the New York, New Haven and Hartford, was rerouted onto new tracks, parallel to the Boston & Albany Railroad. Today, none of the buildings from the first two photos are still standing. The site of the station is now the Boston Park Plaza Hotel, which was built in 1927 as the Hotel Statler Boston in the triangular block between Columbus Avenue, Park Plaza, and Arlington Street. The only visible remnant from the first photo is the Emancipation Memorial statue, which was added to Park Square in 1879 and can be seen on the far left of both photos. 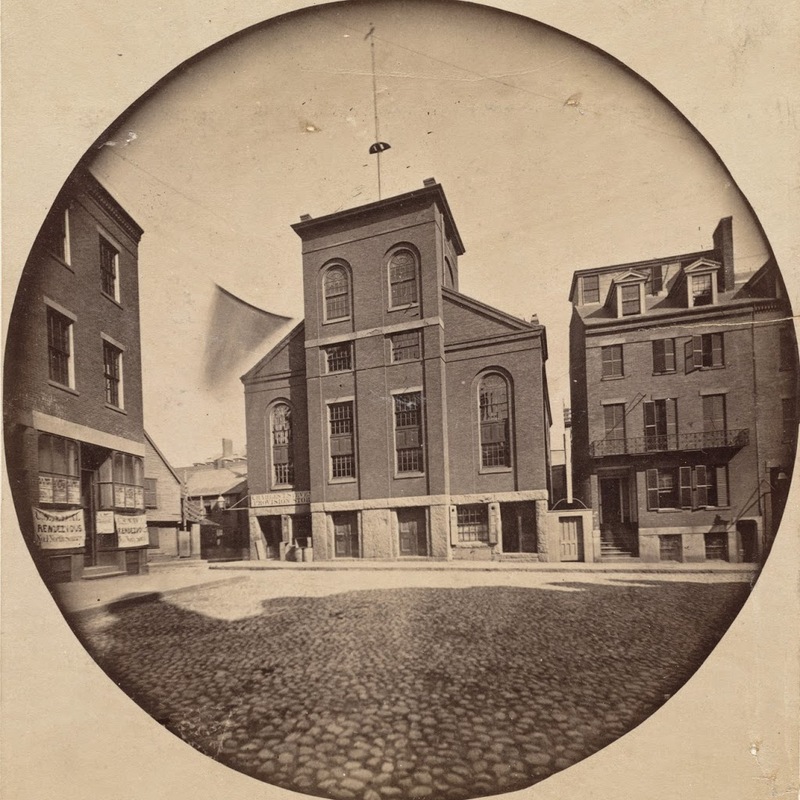 Bethel Church at North Square, Boston, around 1860. Photo courtesy of Boston Public Library. 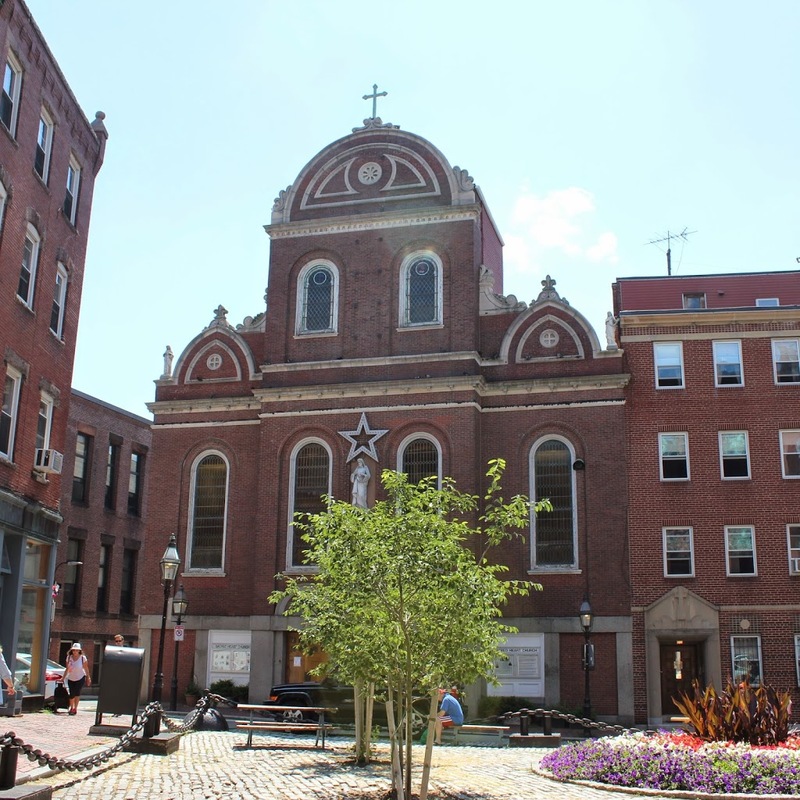 Built at North Square in 1833 by the Boston Port and Sailor’s Aid Society, this church provided Boston’s sailors with a place of worship, and also included a store to benefit sailors and their families. During the 19th century, several notable visitors attended the church, including Jenny Lind, Walt Whitman, and Charles Dickens. In the 1880s, the building was sold to the Roman Catholic Church, and was reopened in 1890, after some exterior renovations as seen in the 2014 photo.